We all know that when our primary relationship is distressed, we feel anxious and depressed. We also know that depression can have a devastating effect on an intimate relationship. It becomes a vicious cycle. There have been numerous studies documenting this fact. Relationships with a depressed partner are often characterized by negative communication, blame, withdrawal, irritability, loss of motivation and loss of sexual interest. It has also been shown that there is a reduction in positive behavior such as eye contact, smiling, and the ability to enjoy pleasurable activities together. Two landmark randomized clinical studies utilized Emotionally Focused Therapy (EFT) in the treatment of couples where one partner was diagnosed with major depression. Both studies demonstrated that when the relationship can transform into one that feels safe, secure and connected, the symptoms of depression are significantly reduced. Characteristics of a healthy, secure relationship – It’s all about the attachment. Having the ability to recover emotional balance even when feeling temporarily stressed or disconnected — without being flooded by anxiety or anger. Your ability to be open and tune in to yourself and your partner. Each partner can express their needs to the other. Capacity to validate and support each other’s feelings even when you don’t agree. Take in comfort and care when offered. Offer comfort and care when needed. Typically do not resort to defensiveness, withdrawal or anger. Conflict is not avoided but dealt with directly. Emotional repairs are made when hurt feelings arise. The relationship enhances one’s sense of really being yourself. No one feels like they have to give up themselves for the sake of the relationship. When negative events happen, each partner is able to construct a narrative that integrates these experiences in a positive way into the relationship. The bond itself helps each partner become more confident, able to go into the world, try new things, solve problems and reach personal goals. The bond makes each partner feel EMPOWERED. Having the ability to turn toward and respond to the other with empathy and caring that consistently renews the loving bonds. Researchers as well as couples’ therapists have shown that couples engage in a “neural duet” which helps each one regulate their physiology, mood, and reactions. Simply said, a secure relationship helps each partner regulate their physical responses to stress, anxiety and depression. This connection between brains and hearts allows us to more effectively cope with life and be more resilient in the face of trauma and loss. 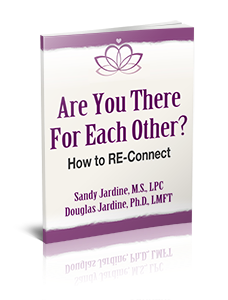 When couples have or can learn to have a secure base, they are no longer held hostage by the painful patterns that have emerged in the relationship. This is especially significant where depression is a factor. When the symptoms of depression such as irritability, low motivation, and hopelessness can be understood as part of the negative cycle both partners get caught in, there is room for working together to see the cycle as the enemy not the other partner. Like most things in life, a secure connection exists on a continuum. Not everyone will feel secure all the time. The key here is to feel you can turn to your partner and feel confident that they are there for you. Even when there is a conflict between you, you can reach for them and they will be accessible, responsive and emotionally engaged (Johnson, 2008). Further, even in moments of stress, emotional hurt and disconnection, each partner can trust themselves and each other so it is safe to reach and the disconnection can be resolved. If you have the symptoms of depression, seek help early for the depression and for your relationship. Don’t let depression destroy the joy in your life, your health and the connection between you and your partner. We now know specific and reliable ways to help couples repair the hurts, disappointments and disconnections that occur in close intimate relationships. You can feel loved, safe and connected again. For help for you and your relationship call Sandy at 480-990-9128. *My gratitude to Dr. Susan Johnson for the development of Emotionally Focused Therapy.